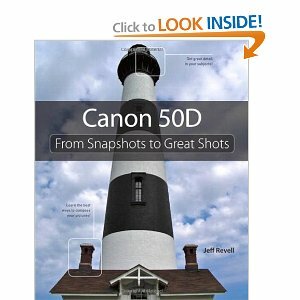 From Snapshots to Great Shots, by Jeff Revell, is a very good book for someone whose first DSLR is the 50D. It does a good job going over the key functions of the camera, and more importantly for beginners, has some really good chapters on lighting, exposure, and composition. If you have owned a DLSR before then the book goes over the basics a bit to much but if it's your first DLSR I would reccomend this book over my favorite camera guides by David Busch. I would also recommend getting the physical version instead of the E-version. It does alot of its teaching via pictures the author has taken, and you can't really see them clearly in an E-book.